These two images above high quality DFO images. Both have been photographed at 800 iso one has been taken on a standard pixel shaped sensor and the other is the Fuji Super CCD. 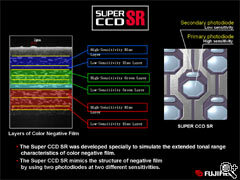 The Super CCD technology from Fuji is very different as the sensor contains hexagon shaped pixels or two different sizes. 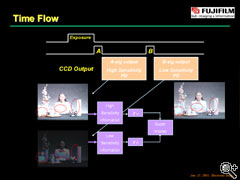 Where once a single photodiode* was responsible for capturing the full range of light strengths at a single location on the sensor, Fujifilm has now paired two photodiodes per photosite**: a larger, primary photodiode adjusted for high sensitivity, with the secondary photodiode for lower sensitivity. When combined, they offer four times the dynamic range† of conventional photodiodes. The image on the left looses the fine detail in section A while the image on the right retains it. 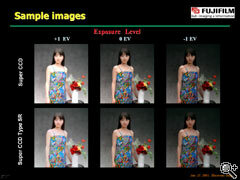 In fact in the right hand image it is possible to use 100 - 800 ISO with very little noticeable lose in image quality. On some occasions they even look better at ISO 800!! In recent developments with digital cameras, the single factor which most influences the amount of ‘digit noise’ is the physical size of the chip and the resulting size of the pixel it’s self. When too many pixels are crammed into a tiny sensor the noise level increases and signal to noise ratio is greatly reduced. The ridge detail in fingerprints is very small and high noise levels quickly cause individual characteristics to become almost invisible. It is always recommended that the photographers uses a low ISO if 100 to 200 as this will help to reduce the ‘noise’ in the image. However in small camera chips (common in consumer grade cameras) even 100 iso will produce an unacceptable level of noise. 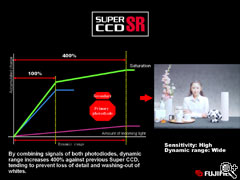 In many instances (such as chemical fluorescence) the level of fluorescence is bright enough to enable the photographer to use a low ISO, this combined with a minimum sensor sixe of APS C will give images with acceptable noise levels. 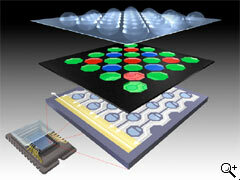 But where the fluorescence is low a full frame sensor will improve the image clarity by reducing the noise. It results from a variety of sources, including sampling errors in pixels, temperature-induced "dark current" in sensor elements, and signal amplification circuits. Compact digital cameras often have as many pixels as DSLR’s, but those pixels are packed into one quarter the space -- or even less. So, for any given exposure, many fewer photons reach each pixel in the smaller sensor than in the larger one, and this leads to correspondingly higher noise. So, the noise in a compact camera at ISO 200 might be the same as the noise in a DSLR at ISO 800. By the same reasoning, an 8-megapixel camera might have much higher noise levels than a 4-megapixel camera if both have the same sensor size. High levels of ‘noise’ cause poor signal to noise levels. The following images show the effect on the signal of poor signal to noise and good signal to noise. Where the signal to noise ratio is poor the background information makes it almost impossible to see the actual image. 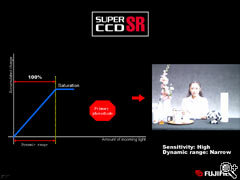 An explanation of Dynamic Range: Unlike the human eye, which can rapidly adjust to differing intensities of light inherent within a contrasty scene, photographic media (film and digital sensors) are constrained by having to align themselves to expose correctly for a given intensity of light. If the camera exposes bright areas correctly, the shadow areas darken out, and detail is lost. 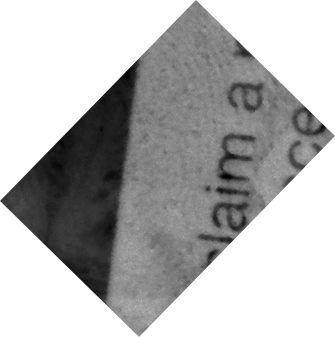 Conversely, if the camera exposes shadow areas correctly, the bright areas will appear as burnt-out whites. A camera with good dynamic range will possess the exposure flexibility to accommodate these extremes and expose both bright and shadow areas correctly. The result of this is that the Fuji cameras have excellent dynamic range. However as technology continues to move, professional cameras with APS C high quality sensors are also able to produce exceptionally high quality images, especially where the ISO is kept below 400. The dynamic range of the Fuji may be exceptionally good but there are other factors that must also be considered when purchasing a camera for specialist applications such as Forensic Imaging. The Nikon D2Xs is a professional end DSLR camera, it has a very high concentration of pixels (pixel pitch) more in fact that the Fuji, and this has additional benefits if you want very fine detail and your AFIS system requires an image resolution of 1000 dpi. While its resolving capabilities are impressive, the very small resulting pixel size puts the camera at a disadvantage when working in low light by introducing slight noise in underexposed areas. Fortunately, the D2Xs has excellent noise reduction software built into the camera, so its images reflect the very high quality one would expect from an expensive digital SLR. The CMOS sensor built into the D2Xs has the ability to resolve about nine times more than the human eye. At 90 line pairs/millimeter (90 lp/mm) the sensor can resolve extremely fine detail. 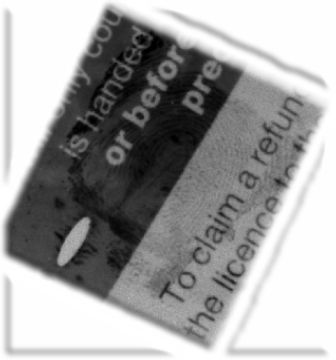 This makes the camera perform exceptionally well when photographing the fine detail in fingerprint ridges and the small irregularities in footwear impressions. The D2xs also has very accurate colour temperature metering, for some imaging application this can be crucial. Both Canon and Nikon now produce reasonably priced full frame sensor cameras, and these do have both pros and cons for the forensic photographer. 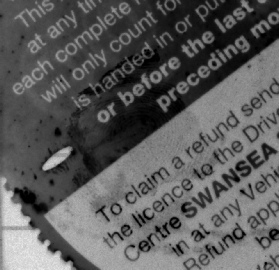 To get the best results from any camera the lens must be ‘the best money can buy’, poor quality optics will produce poor images on the most expensive cameras. Digital camera lens are available in two formats, Full frame (FX) and cropped frame (DX), so what is the difference and does it matter? 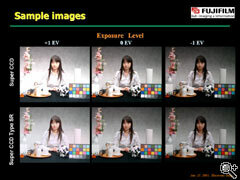 DX frame cameras need the light to hit the sensors at exactly the correct angle, otherwise the exposure can vary across the image, the DX lens is designed to match the chip and ensure that the sensor receives an even coverage of light. 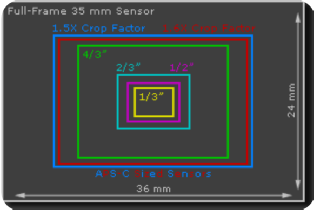 DX lenses on full frame cameras will crop the image so your 12.1 mp image becomes much lower. 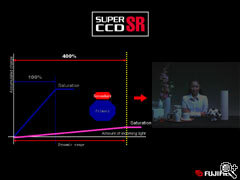 A correct FX lens will give full coverage of the chip resulting in fantastic image quality even in low light conditions. The big advantage with the full frame sensor is that the pixels become larger enabling them to record the light information with much greater accuracy resulting in sharper images with lower noise levels. Full frame cameras such as the Nikon D700 and D3 will capture a sharper image, with a higher dynamic range at high iso’s than any APS C sensor camera (including Fuji). The Nikon cameras also retain the TIFF file format, which while RAW is excellent for most applications, forensic imaging is the exception, here the on camera TIFF will produce the better results (when used in a direct capture mode where exposure and colour balance can be set individually for each image before capture). Best results will be obtained with high quality FX compatible lenses, the new Nikon compatible manual lenses from Zeiss have amazing optical capabilities. See the review on dpreview.